Clarke, R. Allyn and Kenneth F. Drinkwater. "Grand Banks". The Canadian Encyclopedia, 04 March 2015, Historica Canada. https://www.thecanadianencyclopedia.ca/en/article/grand-banks. Accessed 25 April 2019. The Grand Banks are one of the richest fishing grounds in the world. The shallow waters are constantly mixed by the cool current from the north and the warm current from the south, making an ideal breeding ground for the nutrients that feed the fish (artwork by Michael Lee). The Grand Banks, part of Canada's continental shelf, lying southeast of the Island of Newfoundland, consist of several separate banks, foremost of which are Grand, Green and St Pierre; their area (for water depths shallower than 200 m) is 282 500 km2. Water depths over the banks are generally less than 100 m.
The water over the banks is mainly supplied by the southward-flowing cold LABRADOR CURRENT. This current splits as it approaches the Grand Banks, with one branch moving south along the coast of Newfoundland through Avalon Channel to St Pierre Bank. The major branch circulates clockwise around the Grand Bank, concentrated at its outer edge. Warm Gulf Stream waters are generally located south of the Grand Banks, but do on occasion move north onto the southern edge of the banks. Warm air masses moving from the Gulf Stream over the colder Labrador current water produce heavy FOG, especially in spring, when the air-sea temperature differences are greatest. ICEBERGS, carried along the edge of the banks by the Labrador current, are also most numerous in spring. The banks are an internationally known fishing ground most noted for cod, but haddock, redfish, flatfish (including halibut), mackerel and herring are also caught. European explorers first noted the abundant fish resource in the late 15th century, and shortly thereafter the Grand Banks began to attract numerous European fishermen. The first settlements on Newfoundland were established as bases for drying and salting fish for transport back to Europe. In the 20th century, European, American and Canadian boats continued to fish on the banks, being joined in the mid-1950s by large Soviet and Japanese vessels. 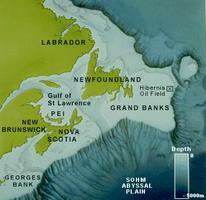 In 1977 Canada extended its offshore jurisdiction to include most of the Grand Banks, and foreign fishing was reduced. In 1992 the collapse of COD stocks led to the imposition of a moratorium on fishing cod over most of the Newfoundland and Labrador banks, including the Grand Banks. Some limited fishing was resumed in 1998 but the cod stocks are still at very low levels and have not yet recovered. Oil drilling, which began on the banks in the late 1970s, gained public attention with the disastrous loss of the OCEAN RANGER rig and its crew of 84 persons on 15 February 1982. 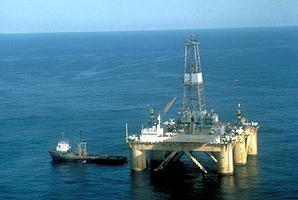 Oil production from the Hibernia oil field began in November 1997, followed by the Terra Nova field in January 2002.